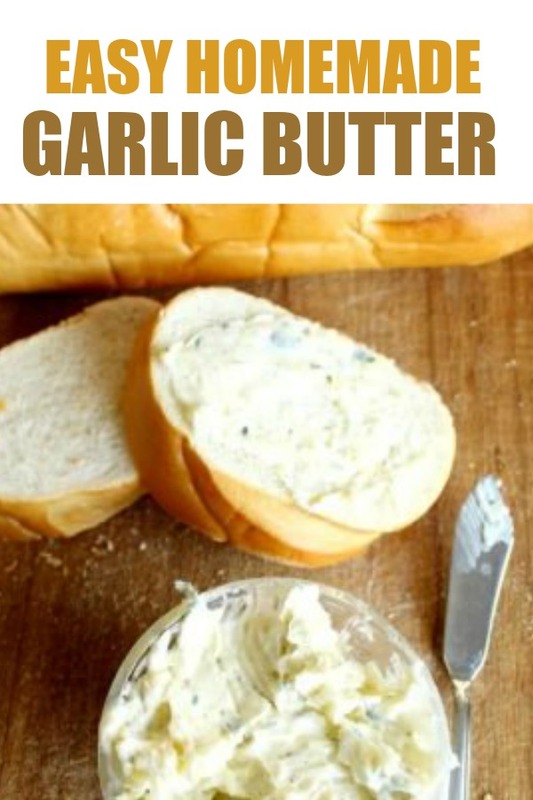 It is so easy to make homemade Garlic Butter! This recipe gives you the perfect balance of flavor and consistency. Homemade garlic butter will quickly become a family favorite that you will want to put on everything! And it couldn’t be easier to make. We used salted butter in this recipe, but any spreadable butter or even margarine would work. We kept our ingredients pretty simple, but the great thing about this recipe is that you can add just about any spices or flavors you’d like (like parmesan cheese). 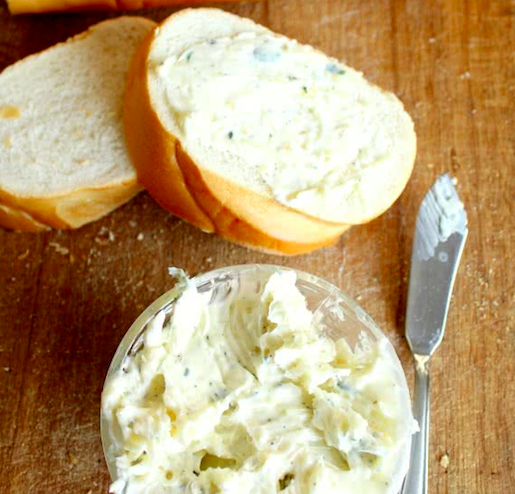 Homemade Garlic Butter is a delicious topping to always keep on hand. You will save money by not buying it at the store, and have peace of mind knowing exactly what is going into your butter. We recently made used this garlic butter for our Roasted Garlic Butter Carrots and can’t wait to try it on other vegetables. It would be delicious with green beans, asparagus, or even on potatoes. My husband also loved it on his steak! I think one thing we can agree on is that consistency makes or breaks a homemade butter. Luckily this quick recipe doesn’t actually require us to make the butter ourselves, but rather take our favorite ingredients and combine them together. Using a spreadable butter in this recipe (such as Country Crock) allows you to keep that same consistency in your garlic butter. We even used the same container to store our butter after it was made, keeping it fresh in the refrigerator. Sticks of butter will also work for this recipe. You will want to store your garlic butter in an airtight container in the refrigerator and thaw to room temperature before use. How Long will garlic butter keep? This garlic butter can be kept in the refrigerator for up to 15 days, as long as it is kept in an airtight container. If you are using hard butter that needs to be softened, we’d recommend only softening the amount you are planning to use, to avoid thawing and chilling your butter multiple times. Hand Mixer: This will be a lot easier and faster if you don’t have to mix it yourself. It also gives the butter a delicious whipped consistency when using a hand mixer. Mixing Bowl: We love using glass mixing bowls, especially for recipes like this where you’ll need to be scraping the sides. Rubber Spatula: Speaking of scraping the sides, a rubber spatula will be your best friend when transferring your butter to the storage container. A regular mixing spoon will work fine, but a rubber spatula will help you get all of that butter out with ease. Storage Container: If you don’t eat all of your garlic butter in one day (which you just might!) you will want to store it in an airtight container. I love the containers like these with the twist on lids. Keeps it very fresh and they are so easy to open and close. Please 6 pieces of french bread onto cookie sheet. Spread garlic butter on each slice of bread. Broil for 3 minutes, or until top of bread begins to be toasted. A delicious way to make homemade garlic bread! Using a hand mixer, combine garlic, parmesan cheese, oregano, and basil until finely chopped. Add softened butter, salt and pepper continue mixing until combined. Blend until mixed. You may need to scrap the sides and mix a little with a spoon. Transfer butter from bowl to storage container. Spread on your favorite bread or store in the fridge for up to 15 days.